Our first module deals with the construction of an E. coli strain, which is able to accept electrons stimulating its metabolism. In addition we are going to identify a suitable reactor system. We focused on the indirect electron transfer via mediators, which are reduced at the electrode in an electrobiochemical reactor and then reoxidized again inside the bacterial cells. The electron transfer system consists of different steps. 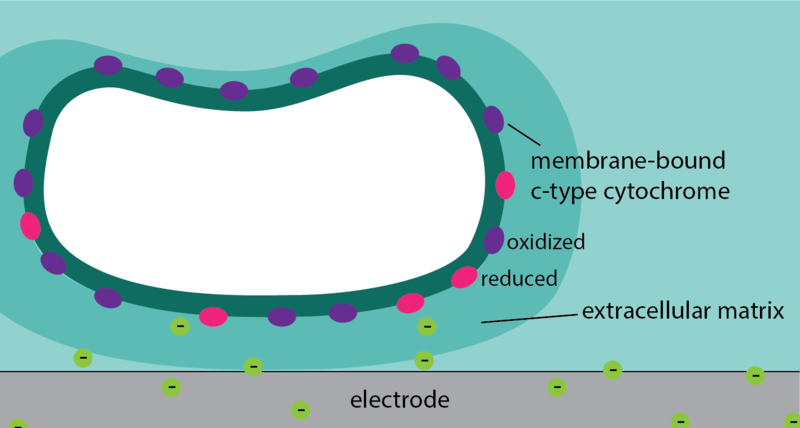 First the reduced mediator has to cross the outer membrane of the E. coli cell. To facilitate that we are going to use the outer membrane porine OprF (BBa_K1172507) provided by the iGEM Team Bielefeld-Germany 2013. Crossing the periplasmatic space, the mediator adsorbs at the inner membrane of the E. coli cell. Electrons have to be transferred into the cytoplasm, but the mediator should not enter the cell, because regeneration at the electrode is crucial. We are going to modify the metabolic pathway of fumarate by a knockout of the C4 carboxylate antiporter DcuB in E. coli and the overexpression of different fumarate reductases. Furthermore the outer membrane porine OprF had to be integrated into the bacterial chromosome to ensure a constitutive expression of OprF and reduce the plasmid overload of bacterial cells. Furthermore we planned to design a reactor system that is suitable of the investigation of electrochemical behaviour in bioprocesses. This includes the possibility to characterize mediators and different electrode materials on the one hand and the electron uptake into the cells on the other. During our research we discovered the H-cell reactor that seems to be an adequate system for our experiments. We called it reverse microbial fuel cell (rMFC). Here you will find the results of the rMFC. Microorganisms can be provided with electrons via two major principles: Direct- and indirect electron transfer. Figure 1 shows the mechanism of an indirect electron transfer in GRAM-negative bacteria. The synthetic or natural mediator (orange hexagons) gets reduced at the cathode and enters the periplasmatic space of the GRAM-negative bacteria through porines in the outer membrane. Afterwards the mediator attaches to the inner phospholipid membrane and gets oxidized by intermediate electron carriers such as cytochromes or other membrane-bound proteins. The oxidized mediator (red hexagons) leaves the cell and is available to get reduced at the cathode again. In this case the mediator is neutral red (NR) and it gets oxidized by the fumarate reductase (FRD). Figure 1: Principle of electron flow of indirect electron transfer from a cathode into a through a mediator. For these reasons we focused on neutral red as a mediator for indirect electron transfer. 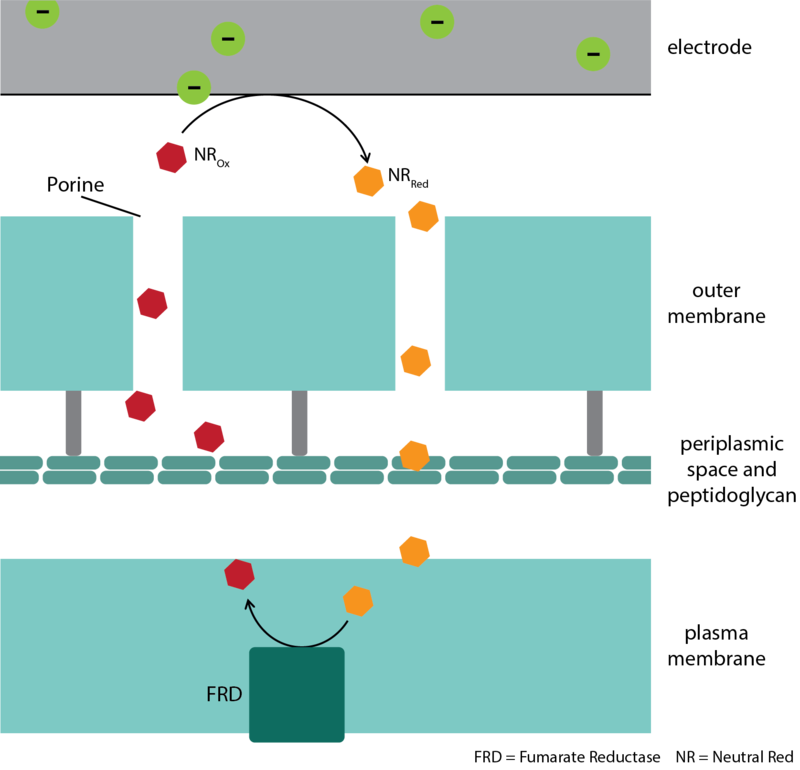 Direct electron transfer describes an extracellular electron transfer pathway without any diffusive electron mediators. It has been demonstrated that outer membrane c-type cytochromes are involved in the electron transfer between an electrode and bacterial cells. The detailed mechanism is still unclear. Figure 2: Putative mechanism of direct electron transfer mediated by outer membrane cytochromes. One special case of direct electron transfer is realized by conductive pili called microbial nanowires. These nanowires belong to the type IV pili and are formed in particular by Geobacter species. They are highly electrically conductive and transfer electrons from the cell surface to the surface of Fe(III) oxides. These oxides function as the terminal electron acceptors for some strict anaerobic species, also called Fe(III) reducers. Due to the fact that Geobacter species are GRAM-negative and naturally competent to transfer electrons they provide very interesting possibilities for the realization of a synthetic electron transport system for E. coli. Lovley, Derek R., 2011. 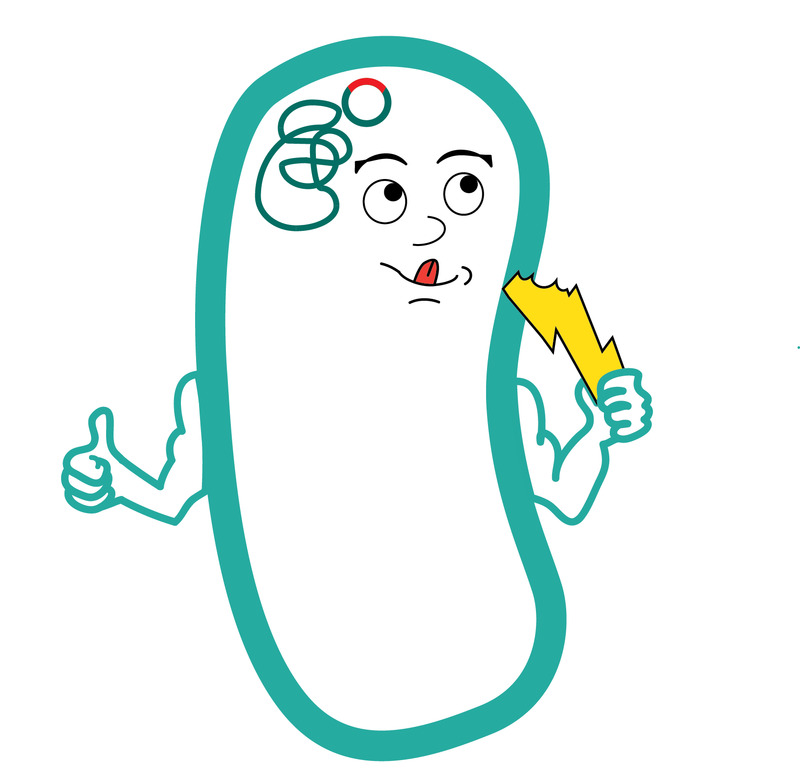 Powering microbes with electricity: direct electron transfer from electrodes to microbes. In: Environmental Microbiology Reports 3 (1), pp. 27–35. Lovley, Derek R. & Nevin, Kelly P., 2013. Electrobiocommodities: powering microbial production of fuels and commodity chemicals from carbon dioxide with electricity. In: Current Opinion in Biotechnology, 24, pp. 385-390. Harnisch, F. & Freguia, S., 2012. A Basic Tutorial on Cyclic Voltammetry for the investigation of Electroactive Microbial Biofilms. In: Chemistry – An Asian Journal, 7 (3), pp. 466–475. Huang, L., Regan, J. M., Quan, X. 2010. Electron transfer mechanisms, new applications, and performance of biocathode microbial fuel cells. In: Bioresource Technology, 102, pp. 316–323. Park, D. H.,Laivenieks, M., Guettler, M. V., Jain, M. K. & Zeikus, J. G. (1999) Microbial utilization of electrically reduced neutral red as the sole electron donor for growth and metabolic production. In: Appl. Environ. Microbiol., 65 (7), pp. 2912 - 2917. Qiao, Y., Bao, S. & Li, C. M. (2010): Electrocatalysis in microbial fuel cells—from electrode material to direct electrochemistry. In: Energy Environ. Sci. 3 (5), pp. 544 - 553. Dantas, J. M., Tomaz, D. M., Morgado, L. & Salgueiro, C. A. (2013): Functional charcterization of PccH, a key cytochrome for electron transfer from electrodes to the bacteium Geobacter sulfurreducens. In: FEBS Letters 587, pp. 2662 - 2668. Reguera, G., McCarthy, K. D., Mehta, T., Nicoll, J. S., Tuominen, M. T. &amp. Lovley, D. R. (2005): Extracellular electron transfer via microbial nanowires. In: Nature 435 (7045), pp. 1098–1101. Stycharz, S. M., Glaven, R. H., Coppi, M. V., Gannon, S. M., Perpetua, L. A., Liu, A., Nevin, K. P. &amp. Lovley, D. R. (2011): Gene expression and deletion analysis of mechanisms for electron transfer from electrodes to Geobacter sulfurreducens. In: Bioelectrochemistry 80, pp. 142 - 150. Lovley, D. R. (2012): Electromicrobiology. In: Annu. Rev. Microbiol. 66, pp. 391-409.